Consists of natural ingredients that help fight against malignant disease, combined with advanced technology in extracting nutrients from plants to maximize the benefits. There are a lot of patients with malignant disease, many of which who can defeat the disease or be able to live a longer life with the help from CA Herbal. CA Herbal would like to encourage everyone to take care of their health through simple instructions that are easy to follow from our health articles. And remember, there are ways to overcome the disease! How can CA Herbal help you? White blood cells in our body are responsible for disinfection and removal of foreign bodies, including malignant cells. 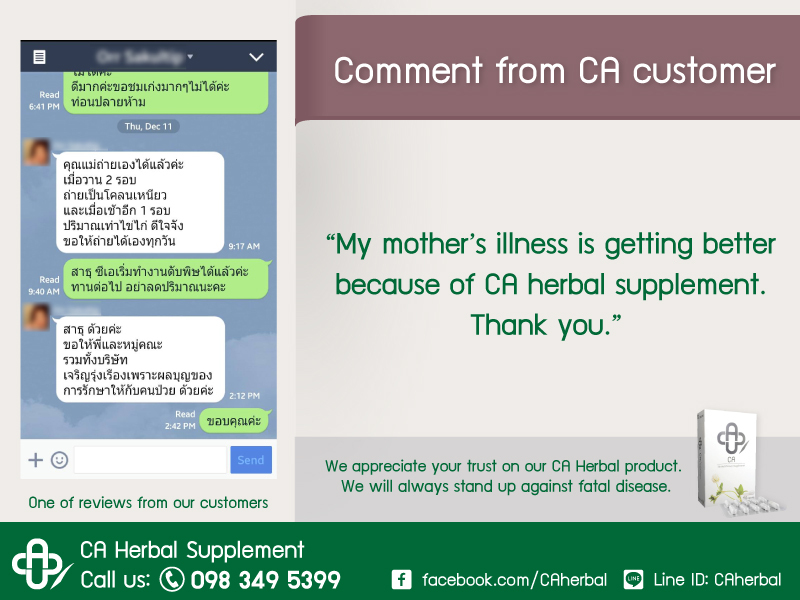 CA Herbal contains Thai herbs that nourish white blood cells, making them function better and more efficient. As a result, when malignant cells occur, white blood cells will be able to eliminate them from the body quickly. © Copyright - Nasaema Industry Company Limited.